It is often difficult to choose toys that kids will surely appreciate or love. While we tend to say that it is in the thought of giving that really counts, for young children, it is more about how much fun they can derive from the gifts or presents that we give that really matters. For them, toys are everything. In the point of view of experts, toys are the instruments that help facilitate optimum child growth and development. It is therefore important to choose toys that are not only fun and will be appreciated by kids but are also developmentally-appropriate. 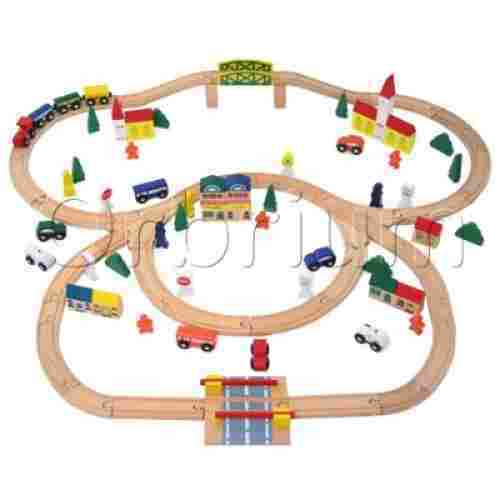 One of the most beneficial toys when it comes to the development of creativity, imagination, dexterity, psychomotor skills, and cognitive skills is train toy sets. This 2019, we have listed the 18 most popular train sets for kids. We have reviewed each train set for kids on this page and created a list with the 10 top train sets from the current marketplace. Each product has an updated status and the criteria sections have also been updated. 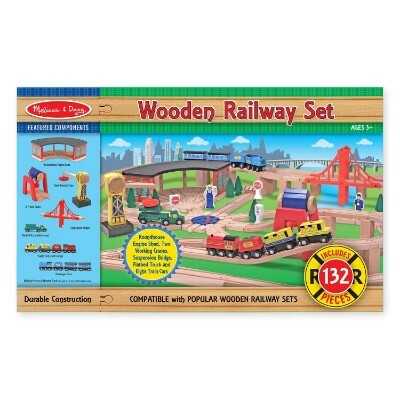 With 132 beautifully crafted wooden pieces, the Deluxe Wooden Railway Set is a kid’s dream playset. 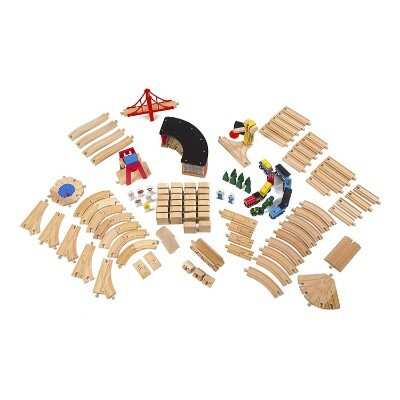 It comes with 100 wooden tracks and support sections as well as 30 other accessories including 2 cranes with magnetic attachments, a train house, and a bridge. It also comes with a flatbed truck, a passenger train, and a cargo freight train. 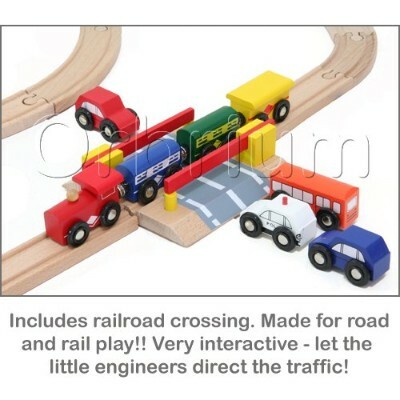 It comes with an easy-to-follow instructional guide to help build the train tracks in 4 different configurations. This train set has everything a little conductor needs to stoke their imagination. 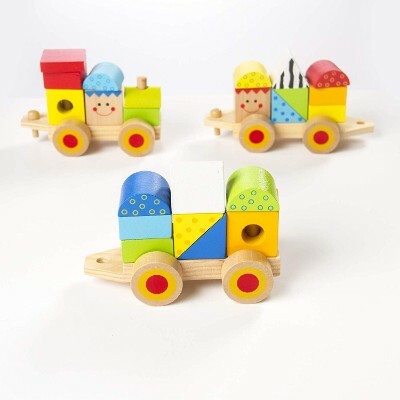 Special care is taken to ensure that children won't get derailed when playing with this set. The smooth wood is polished free of chemical sealants and all screws are set into the wood. And with many possible configurations along with not needing batteries, this train provides endless entertainment. It’s got plenty of pieces to stimulate kids’ imagination and creativity. It’s also great for enhancing kids’ problem solving skills especially if they decide to create their own track configuration. Trains are big-fun for a small kid one of the most promising childhood toys if your looking to build beautiful lasting memories. 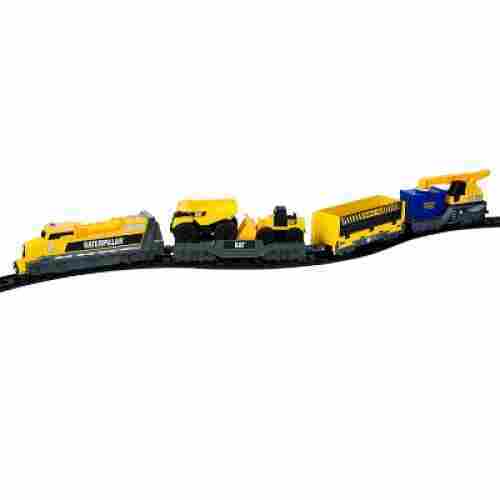 Build up quite the train with this Learning Locomotive train set. Re-arrange the quirky blocks to have some pretty fun outcomes. Whether it be a triangle on top or a solid orange square kids love to pull around their latest creation. Pegs keep all of the pieces in place on the move and don't hesitate to be move quickly or slow across the kitchen floor. Made of high quality solid wood and the smoothest rolling wheels. Plan to have hours of play with this train set for many years to come. Spark the shape learning in your young one -- this train is built just for that actually. Coming with 23 varying blocks of all shapes and sizes. They are painted with smiles and contrasting colors keeps it easy for kids to remember the shapes of the blocks. This train just keeps on chugging! In the house or in the kitchen your little train can go anywhere you'd like it to. The blocks stay atop easily with the mini pegs that are used to keep the blocks in place once they are stacked atop. While not necessarily a toy by itself, the Go! Go! 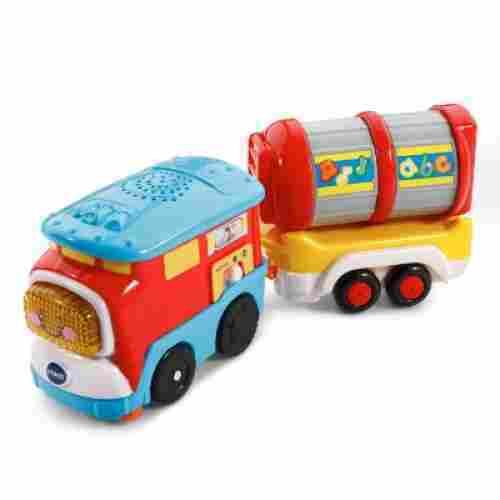 Smart Wheels Carry-All Cargo Train can be a wonderful addition to the Go! Go! 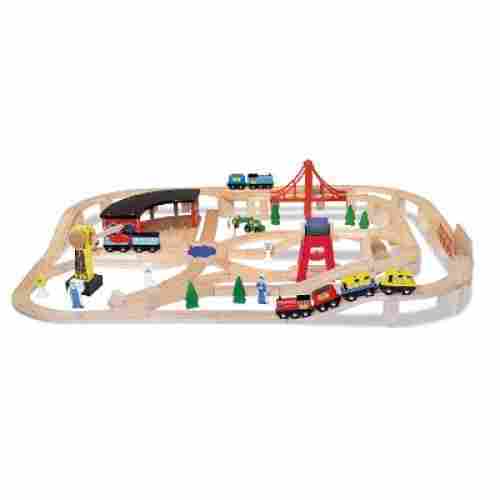 Smart Wheels Train Station Playset also listed here. 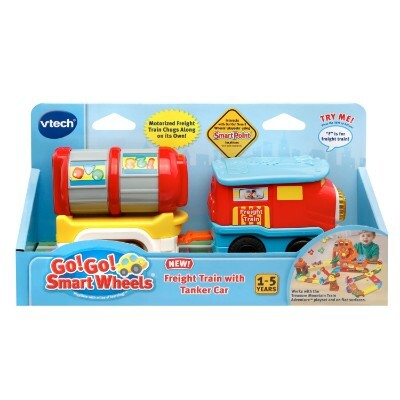 The colorful 2-piece train features an engine and a cargo cars complete with the unique SmartPoint technology of VTech. This activates learning phrases, fun music, and other interesting sounds. 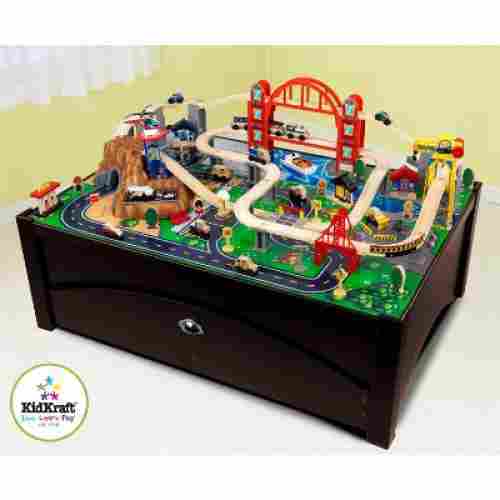 The Carry-All Cargo Train set is a great gift for any youngster ready to explore the love of trains. They can get a little exercise by self-propelling their train set. 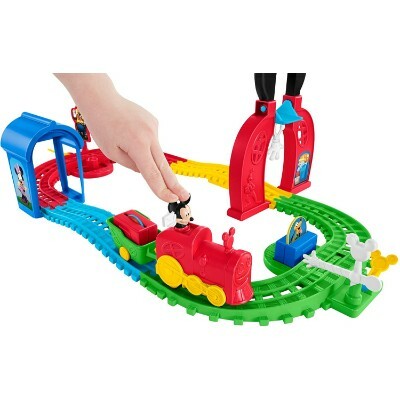 The set of three cars detaches allowing them to play with this set as one long train or three little trains. When they are ready, the train re-hooks in any order. Best of all is that this train can go off the rails! This makes it a perfect toy for outings and at home. It’s a part of a much larger system. It is often advisable to play it with the train playset although it can also be played by itself. The cargo help develop fine motor skills while at the same time facilitating spatial intelligence and problem solving. 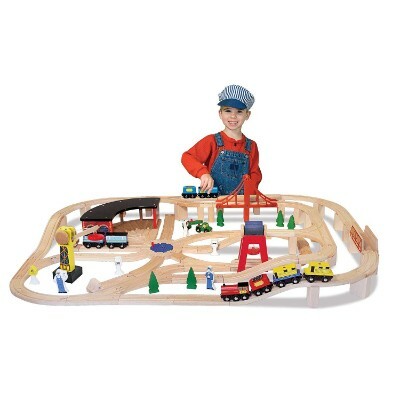 With a unique track layout and beautifully crafted train, tracks, and accessories, the Triple Loop Wooden Train Set is something that is ideal for imaginative play. It comes with 100 wooden pieces with provisions for track expansion. 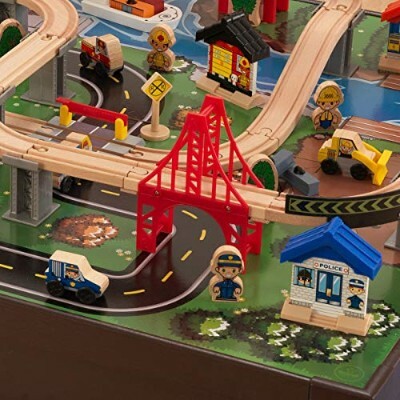 The playset includes a train engine with several coaches, city vehicles, railroad crossing, a bridge, houses, train station, commercial establishments, and a church. It also comes with trees and people figures. Let their imagination run wild with this complete train village. They can be mayor of their own town and direct the rail how they want. Not only does it have trains and coaches, but the set also includes commercial businesses, a church, houses, train stations, little people and trees. With so many amenities to play with, kids as old as 15 can use the set to recreate their own neighborhood or use it for school projects. It’s a small community made of wood and surrounded by beautiful wooden tracks. The fact that it can be expanded simply means that the creativity and imagination of children can also be enhanced. And this leads to the enhancement of their problem solving skills and other cognitive skills. Moreover, it fits any other toy train like Thomas, Chuggington, and Brio. One of the most unique toy train sets we have in our list is the Metropolis Train Set. For starters, it already comes with its very own area to play on so that already solves the problem of where to build the playset on. The toy comes complete with trains, mountains, highways, cars, simulated river with a riverboat, bridges, cranes, a helipad, and an airport. There are also figures of people as well as road signs and building structures. It doubles as a convenient storage space for the removable pieces and accessories. 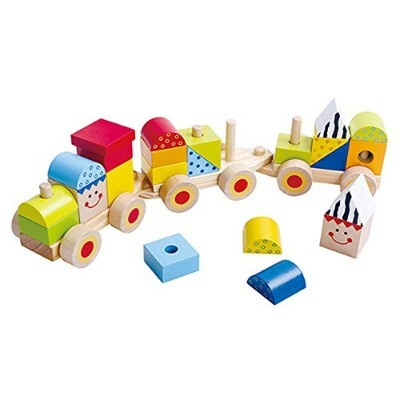 For more great products like this, our article on the best train play spaces might be helpful. A truly magnificent toy, this train set is a self-contained city of fun. Even adults can’t help but play along and see where the avenues of imagination take them. Complete with everything you need to build a sprawling mega structure, this set stands apart. 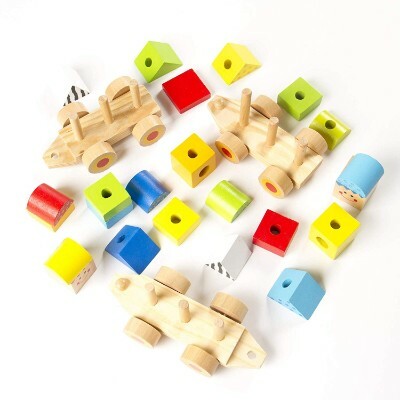 This set promotes problem solving, creativity and motor skills in the best ways possible for many ages. It’s a very simplistic interpretation of a large metropolis with the train system at its core. It helps introduce children to what a mega city looks like. This helps them appreciate the different modes of transportation while at the same time enhancing their creativity, imagination, counterfactual reasoning, and divergent problem solving skills. Imagine a 3-unit wooden train chugging along a perfectly circular track and you now have the Starter Train Set by Maple Landmark. The tracks are laser-engraved to make sure the maple-wooden wheels of the magnetized train set will be chugging along as effortlessly as possible. The track can be used on either side for flexibility in track lay-outing. 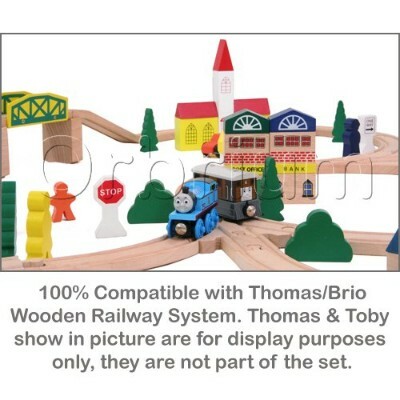 The set comes with a train engine, a train coach, and a caboose linked to each other by magnets. The train set is finished with non-toxic dye. 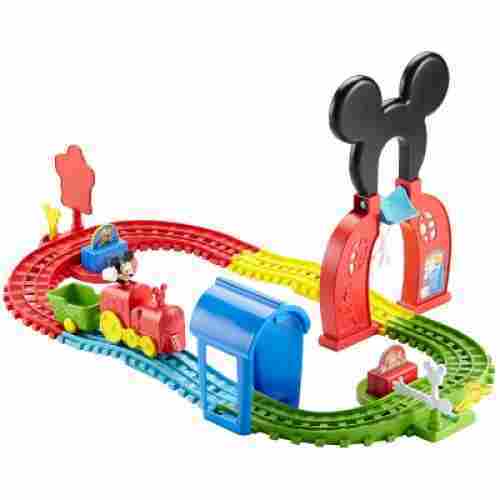 This starter train set is great for young kids just getting started. Made of great smelling wood, non-toxic die and several large parts, even the youngest children will love getting to build their own tracks. Kids will develop their motor skills, imagination and have hours of fun with this simple toy. The manufacturer recommends a minimum age of 3 years but we have seen many parents giving the toy as gifts to kids as young as 1 year old. 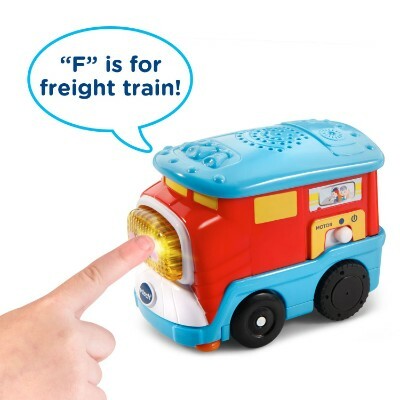 If you purchase the Name Train Letter Cars, you can help improve the language skills of kids. Nevertheless, it can help in promoting kids’ creativity especially with the fact that it can be used with Thomas and Brio trains. 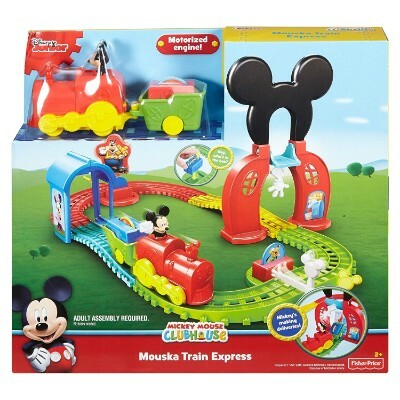 If you have kids who love Mickey Mouse, you might want to give them the Fisher-Price Disney Mickey Mouse Clubhouse Mouska Train Express Playset. 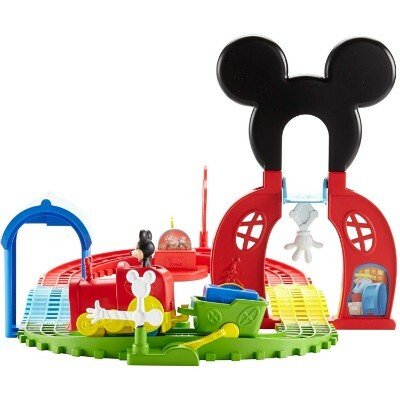 The toy set comes with colorful tracks going through a Mickey Mouse arch on one side of the track and a colorful tunnel on the opposite side. It comes complete with Mickey Mouse riding the Mouska with a cargo tender in tow. 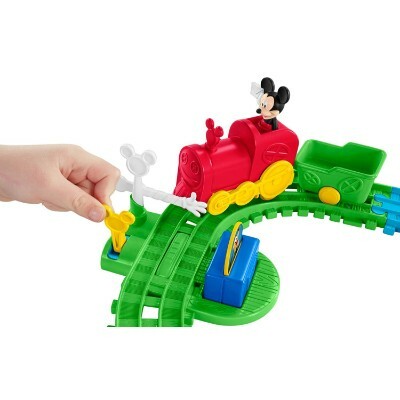 Introduce your children to the Magic of Disney with this unique train set any little one will love. The set will help young kids understand colors as well as work on their creativity as they put the tracks together. See their imagination run wild as they help Mikey deliver packages while running their adorable train through tunnels. It’s a great way to help reinforce kids’ mastery of colors as well as the characteristic shape of Mickey Mouse’s ears. It also helps develop fine motor skills especially for younger children. 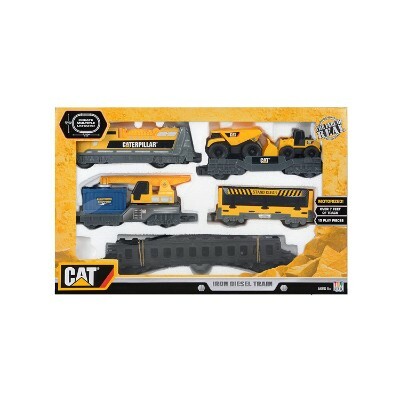 If you have kids who are fascinated with both trains and heavy construction equipment, then you should give them the Caterpillar Construction Iron Diesel Train playset. 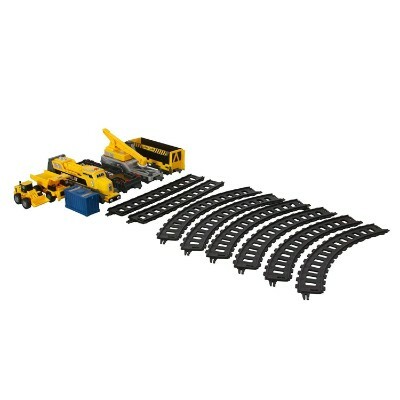 t already comes with more than 7 feet of track to provide a platform for the 5-unit train that includes an engine, 2 trailers, a caboose, and a shipping container crane. It also includes a CAT dump truck and a payloader. This unique train set is all about construction vehicles. Your little one can get creative by adjusting the tracks as they please while learning to identify the different machines. They can use the toy cars to pretend they are either on the track or build the track as a construction team. The motorized train has cargo cars that carry construction vehicles, your kid will be entertained for hours because they will most certainly put other toys they have onto the cargo cars. 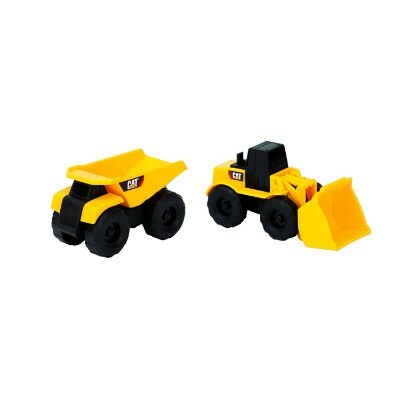 It’s perfect for playing together with CAT Mini Machines and other CAT playsets. It stimulates imaginative play which, in turn, helps reinforce problem solving skills. It can also be used as a foundation for track and playset expansion. Our dedicated staff searched the web and researched every set in the yard to bring you the top 8 best train systems. These trains are for different age groups, and they all encourage different lessons for the different years of development. We made sure these trains are well made, sturdy and good looking. 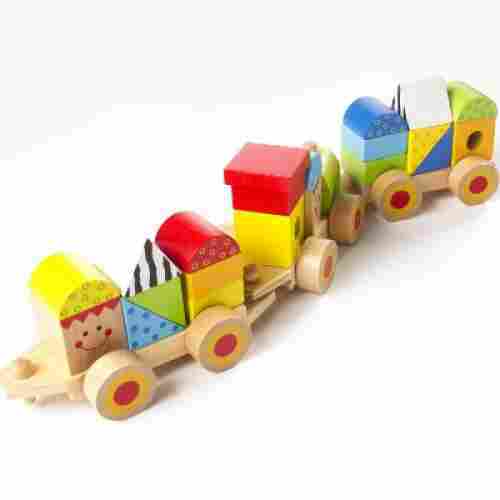 Even after a child has outgrown their train it can be proudly displayed on their shelf or passed on to the next in line. 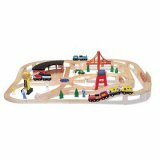 Train sets like the Melissa & Doug Deluxe Wooden Railway Train Set, 100-Piece Orbrium Toys Triple-Loop Wooden Train Set and the Maple Landmark Name Train Starter Set are wonderful toys for, especially young children. they provide a gentle and robust introduction to the wonderful world of trains. Little kids get to put together a simple track together and push their cars around but don’t have to worry about batteries or messy liquids. As little ones grow, they can graduate to more complicated sets that provide a greater challenge. Sets that are more complex present a thrilling challenge for slightly older kids. They can use their creativity to put together more complicated trains and tracks together. Advanced trains and tracks are electric and are not meant to be used as a starter play set. A train set like the Lionel Polar Express Remote Train Set is a great gift for a young 8-year-old already enamored with trains. A child at this age is just about ready to start appreciating the art of collecting. This type of train is not meant to be thrown into a toy chest, it’s meant to be played with or displayed. Other pieces can be bought to begin a collection as well. And generations of people have enjoyed how great these types of trains look running around a Christmas tree. There are many factors that need to be considered when choosing the best toy for any kid. The train set must be age- and developmentally- appropriate for it to be really meaningful and worthwhile. Secondly, it must be safe and made of only the highest quality materials. The design must be appropriate for the child’s developmental age – simple yet challenging enough to stimulate curiosity, creativity, and imagination. Also, the toy manufacturer must be reputable, credible, and trustworthy. Moreover, the price of the toy must be affordable enough to be considered as valuable gifts. And lastly, the toy must have passed the discriminating tastes of parents the world over. With all of these factors carefully considered and duly scrutinized, our researchers have come up with the 18 best train sets for kids this 2016. Building with train tracks is a wonderful way to spark kids' imagination. The free time building and exploring their imagination using train tracks allows them to explore their creativity and build as it appears for them without a set of instructions or a picture. 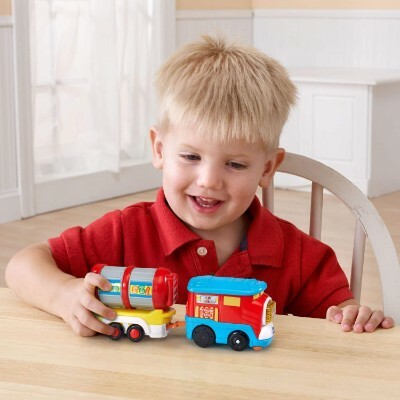 Trains are an hands on accessory that kids of all ages love to play with. When they are young playing with the trains without tracks is fun and as they grow adding the tracks and the challenge of building a new way each time proves to be just as entertaining. Studies now show that train sets are highly beneficial in the development and enhancement of kids’ problem-solving skills especially in terms of matching the correct tracks, the organization of the track layout, as well as the assembly of the train cars. Because train tracks can be set in a variety of layouts which can ultimately affect the overall speed of the train, this stimulates the development of divergent problem-solving skills. This kind of critical thinking allows kids to look at a particular problem from different angles leading to the formulation of a variety of possible solutions. In real life, this allows kids to determine the best possible course of action from several choices when presented with a particular problem. Train sets can also help facilitate the mastery of other cognitive skills such as critical and logical thinking, counterfactual reasoning, and spatial intelligence. Train sets are also instrumental in enhancing dexterity and mastery of fine motor skills. 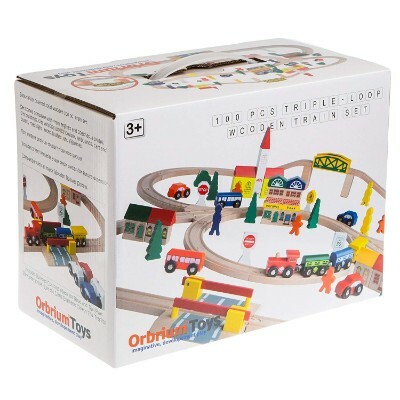 Train toy sets come in a variety of smaller pieces that need to be connected to one another. This requires absolute coordination and control of the different muscles and tendons of the fingers and hands. 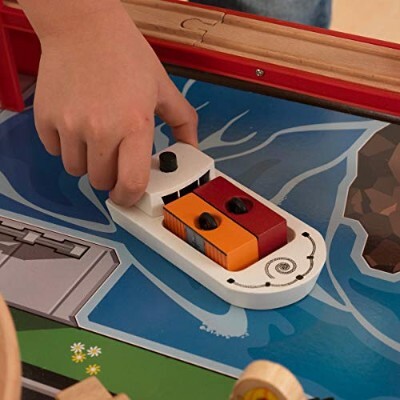 Hand-eye coordination is also essential as children will need to make sure that the train pieces are slotted into their correct positions lest the train will be derailed and the whole playset undermined. Fine motor skills are important to growing children as they need control of smaller muscle groups to help them in their daily lives. From buttoning their shirt to writing their homework or even feeding themselves, they depend on the mastery of their fine motor skills to help them through adulthood. Additionally, train sets can be excellent instruments to stimulate children’s imagination and creativity. In fact, train toy sets are just one of a few children’s toys that even grown-ups seem to never have enough of. Entire basements can be turned into one gigantic train landscape complete with mountains and other geologic features, mini-cities, cars, and vehicles, train tunnels and bridges, and everything in between. The fascination children get from playing with train toy sets help them to be more creative and imaginative in their thinking. Role-playing and make-believe play are all important aspects of train play as it allows them to explore infinite possibilities. q: Should a parent purchase electronics or train sets for their kids at an early age? Buy them train sets at an early age to help teach them values that they can’t learn with electronics. Children are now spending twice as much time either watching T.V., playing on the computer, phone, and games. The U.S. has an obesity epidemic and when kids spend too much time glued to a monitor, they’re not working out. But, because the children’s market is worth billions, there is a lot of pressure for children to want expensive electronic items that help them fit in with their fellow classmates. q: Should I keep electronics away from my children as much as possible? No, electronic devices will eventually become a part of their lives. Schools are now implementing laptops and computer devices to help with their education. And for most parents, they need their kids to have a cell phone to be able to get a hold of them. What kids need to learn is how to manage their screen time vs. physical playtime wisely. A few hours of T.V. a day is O.K., but encourage them to want to play outside or work on their collectible train sets or other toys. q: Do electronic toys that are supposed to teach kids their alphabet and numbers actually work? Yes, they do. They help introduce subjects that they’ll cover in kindergarten. When kids are about 4 to 6 years old they can learn a new language using language learning games. q: When do kids start to become interested in the real world? As early as 3 to 5 years old, kids start to ask millions of questions that start with the word ‘why’. They also start to want to show off what they have learned. When kids start to put together their train sets at that age, they’re going to want to show off what they have accomplished. They’ll probably ask millions of questions like, why are the trains made of wood and why are the trains painted? q: Which train systems will keep little kids interested in a long time? It’s all about feedback. Toys that provide clear feedback on whether the answer is correct or not keeps kids interested in engaging with their toy. Some train systems are designed to be put together in several different ways. These are the types of trains that will keep little kids engaged and interested for a longer time than other tracks that can only be put together in one way. q: Can kids be encouraged to love math and physics with toys? Yes, toys that encourage building and construction will help introduce physics and math concepts at an early age. Train systems that are no put together properly won’t run correctly. Trains won’t go up the hill or they’ll fall off the track frequently. Building and playing with train sets can help children learn the intuitive elements of physics and math while encouraging them to ask questions about their world.